Many of you have probably seen these German helmet decals on eBay, and wondered as I did, if they could be used for 1/72 scale figures. 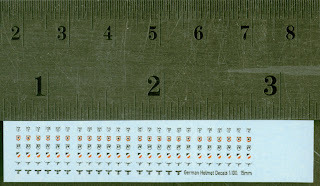 The sheet contains 130 decals including helmet markings for Heer, SS, and Luftwaffe. 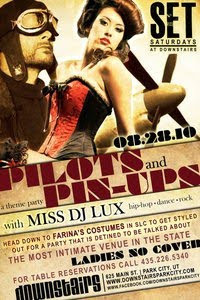 There are also some decals for what look like Heer breast patches as well. 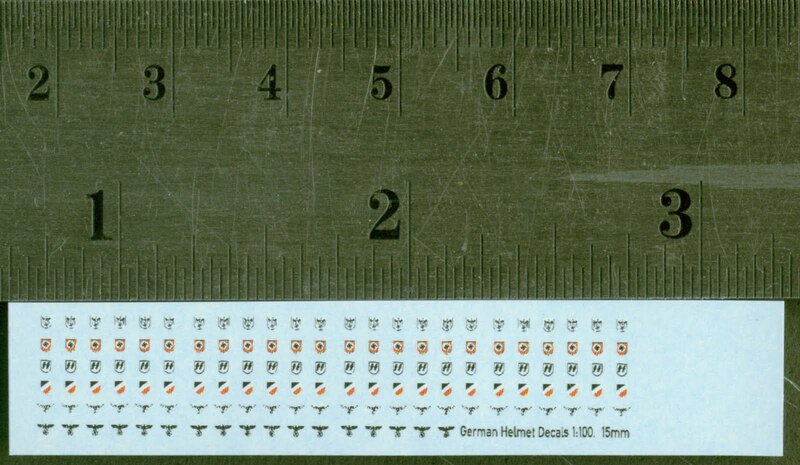 There are three different sizes for the German helmet sheet, putatively listed as 15mm, 20mm, and 25mm. 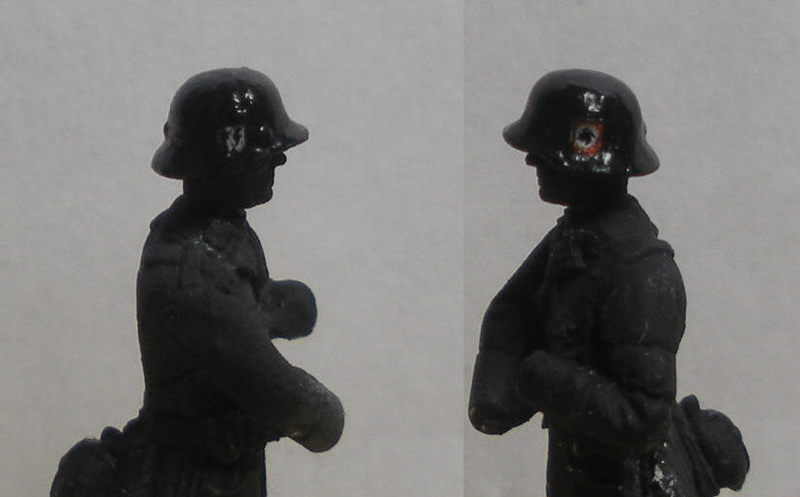 However from the image used in the eBay listing, the 15mm markings looked oversized when used on 15mm figures to my eye. Still, I decided to buy a set of the 15mm decals to see how they would look on 1/72 miniatures, since they were definitely too big for 15mm figures. When I received the decals, I took a look at them under the magnifying glass. The blacks and whites are decently printed for the size, but the red coverage for the Nazi Party decals and National Tricolor decals is not complete, and can be seen as alternating red and white spots. I didn't do a very good job on the decal application for this post, because someone gave my thumb a good bashing during kendo practice, so my hands were not really good for detail work today. So take note that the decals can look much better than in these pictures. I botched the trimming when I was cutting out the decals and tore the SS Runic Shield. There's probably some extra transparent film that was stuck on the decals as well. 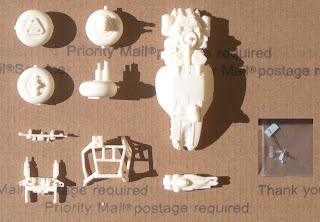 What I did notice though, was that the white for the Nazi Party decals looked out of register on one side, and more importantly, the markings are definitely too large for 1/72 scale figures. 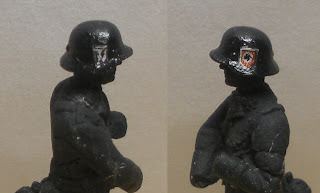 The actual size of the decals relative to the helmet can be seen at German-Helmets.com. To try and fix these problems, I painted out the white areas with black paint. In fact, I used the paint to reduce the area of the decals as well. Looks better, no? The next time I apply these decals, I will cut them out using my dissecting microscope, and use decal setting solution to make sure they are nice and flat. 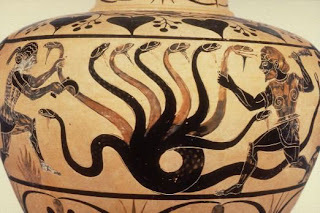 The Lernaean Hydra of Greek mythology was a poisonous serpent-like monster with nine heads, that took its name from the lake near which it lived. 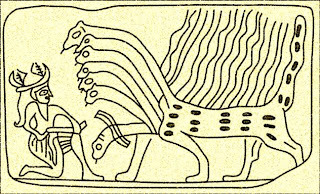 The creature became famous as the second boss in the Twelve Labors of Herakles. 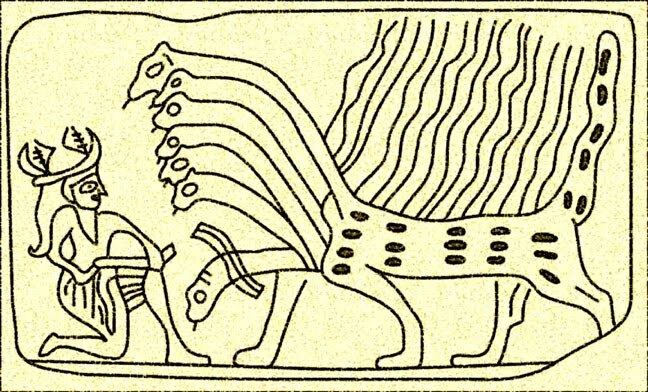 In later times, the image of the hydra became conflated with the Beast of Revelation so that nine heads were reduced to seven, and the body turned from serpent-like to dragon-like. "And I stood upon the sand of the sea, and saw a beast rise up out of the sea, having seven heads and ten horns, and upon his horns ten crowns, and upon his heads the name of blasphemy". Anyway, enough background, and onto the miniatures. Of the nine-headed hydra miniatures that I am aware of, only the Dennis Mize Hydra (Ral Partha 01-192) is still in production (available from IWM). 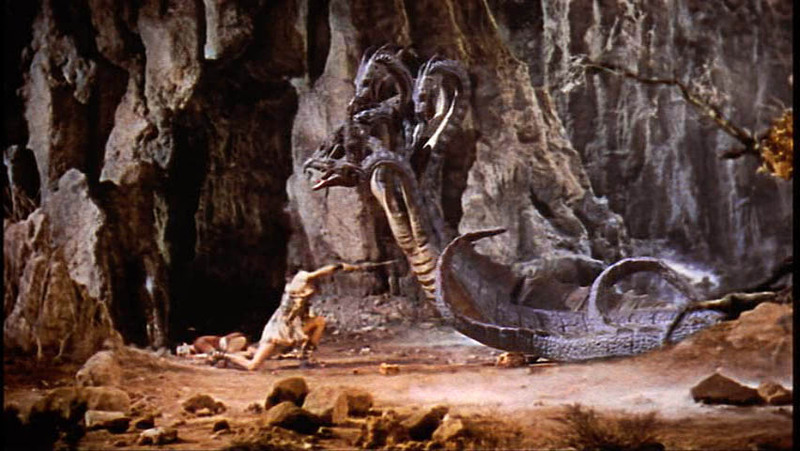 The other nine-headed hydras include the Minot hydra from the Olympians, Heroes & Horrors range, and the Starcast hydra from their Fantasia Myth line (which I have never seen). The Mize Hydra is a four piece model, with the heads cast in groups of three. 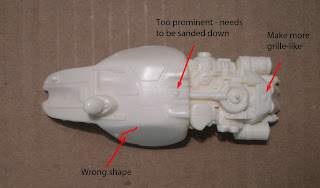 There is an unfortunate design flaw in this particular miniature because after you attach the heads, the miniature becomes front heavy, and always tips forward. It is managing to stay upright in the picture with the help of some UHU Tac. The Tom Meier Hydra (Ral Partha 10-417) is the large Revelation-type hydra with seven heads and a dragon-like body. 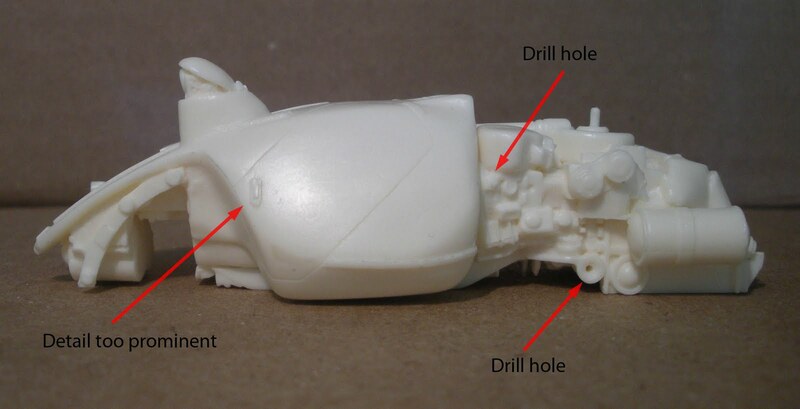 The model comes in five pieces, with three parts for the heads, and two for the body. I reposed the heads for this particular hydra, since many of them were pointing in all kind of weird directions. I also cut out the middle of the base for the front legs to make it look less obtrusive. The last two hydras are sculpts by Julie Guthrie. On the left is a plastic Mage Knight Hydra, which is identical to the Hydra from the All Things Dark and Dangerous line (Ral Partha 02-901). This particular hydra has seven heads, and the metal version is still available as a multi-piece model from IWM. On the right is a five-headed Dwarf Hydra (Grenadier Fantasy Classics 318/Fantasy Lords 124). The heads of this particular hydra bear a close resemblance to that of the Harryhausen hydra. There are a couple of other hydras that I will probably get in the future, including the Alternative Armies Giant Hydra, and a three-headed hydra from M.Y. Miniatures. What to do with all these beasties though? It's probably nothing to crow about, but I've finally actually come close to finishing a model this weekend. The kit is a limited release resin model by TENBOWKISSA of a Zerstover. The Zerstover (I think that the name is actually supposed to be Zerstörer...) comes from the Maschinen Kreiger universe, and is essentially an armored lunar rover. 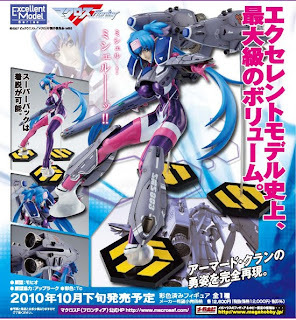 This kit is a release from the 2007 Tokyo Wonder Festival according to the box top. 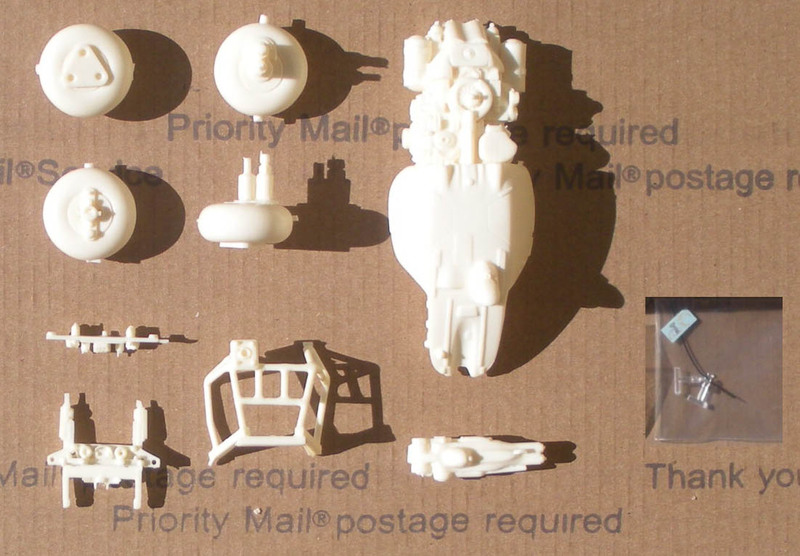 It comes with 9 resin parts, two clear plastic parts, a length of wire, a small decal sheet, instructions, and a camo card. 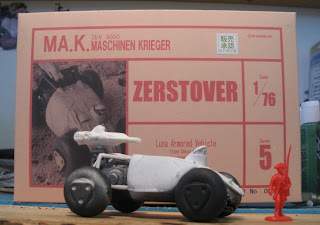 The model is a decent representation of the Zerstover, though the shape of the hull doors is not quite correct. In the actual Ma.K. build, the forward part of the doors are raised (and in fact, the instructions for this kit shows this). There are a couple of areas where the features are a little overscale as well. I did some minor fixes, but left the kit as is for the most part. The casting for the kit is quite nice. There were some minor bubbles around the pour tab of one of the wheels, but other than that, there was only a little bit of flash, some light seams, and the pour tabs to clean up. 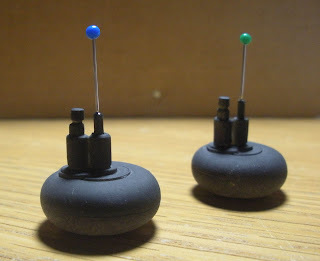 Oh, did I mention that this is the first resin kit that I've attempted? Anyway, this is probably standard practice, but I did a lot of pinning for the kit, particularly the rear wheels, since the body was relatively heavy, and the parts where the axles join the undercarriage did not seem particularly robust. Now all that's left is to finish up painting, putting the plastic light lenses in, sealing, and applying some decals.